SUNRICE is closing its Deniliquin 1 rice mill and scaling back operations at its Deniliquin 2 and Leeton mills in response to limited availability of affordable water for irrigation, which looks set to slash NSW rice production from the Riverina in 2019. The Ricegrowers’ Association of Australia (RGA) is the parent of SunRice, and its president, Jeremy Morton, has leveled much of the blame for the scarcity of affordable water at the Murray-Darling Basin Plan. “While the drought is a significant factor, there is no doubt that the Basin Plan is responsible for some of these people losing their jobs,” Mr Morton said. “All the evidence shows us that the reduction in the pool of productive water means less people with a job. “All those who voted for this reform in 2012 need to own this outcome,” Mr Morton said. Closure of the Deniliquin mill, and scaling back of SunRice’s milling operations at Leeton will result in the loss of close to 100 jobs. The RGA has long been critical of the Basin Plan, which currently seeks to recover an additional 450 gigalitres of water from productive use. “The RGA provides that all water recovered from productive use results in negative social and economic impacts for basin communities, irrigators and industries, in particular due to the flow-on effects of increased water prices. The Murray Darling Basin Ministerial Council (MinCo) of State and Federal water ministers will meet on 14 December to decide on the future of water recovery through the Basin Plan. “A decision at MinCo to further reduce the amount of water available for producing food and fibre means more people without a job, fewer jobs across our entire community and the nation. “That is the power of water, because without water we have nothing. Mr Morton said the impact of SunRice’s scaled back operations will be felt “from the farms to the service and processing sectors”. SunRice said the Riverina’s 2019 crop size was anticipated to be the second-smallest recorded since the start of the Millennium Drought in 2003, but carry-over irrigation allocations would allow the continuation of the reduced milling program next year. SunRice CEO Rob Gordon said the welfare of SunRice employees was the company’s current priority. “This has been a very difficult decision, and in no way reflects on the dedication or commitment of our people,” Mr Gordon said. “We deeply regret the departure of loyal SunRice staff, and we look forward to returning to more normal production levels in the future when we can expand our workforce. “The decision to reconfigure Riverina milling operations in 2019 is necessary to ensure a competitive and sustainable business for our employees, growers, shareholders and the communities we support. Mr Gordon said a pillar of SunRice’s 2022 Strategy has been to build the company’s operational resilience, which has included an acceleration of its building of a global supply chain. “This ensures the business is well positioned to meet growing demand from our customers around the world and can mitigate against fluctuations in crop sizes during times of drought. 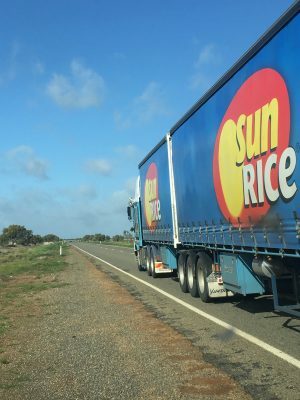 “In low Riverina crop years, SunRice can now flex its offshore supply chains to meet demand and maintain our presence in premium markets. SunRice’s packing and warehousing operations will also be reconfigured by August next year, and said this week’s announcement followed an an extensive review process. The company said it was focused on minimising the number of job losses, and was exploring all available options with employees and unions to retain as many people as possible. This includes options to relocate employees, job sharing, and temporary leave. Operational and support roles at SunRice, and at SunRice’s Australian Grain Storage (AGS) sites will also be affected. Phase 4: Deniliquin Mill 2 shifts will reduce to 8/5 from 16/5, effective July/August 2019.